"This is an old placeholder concept image that we accidentally leaked. Everything in it is ancient, certainly nowhere close to final," he said. "Enjoy checking it out, at this point, but don't expect everything to carry through to the stream on the 11th," Luckey wrote, referring to Thursday's press event, which is being streamed on the Internet. One of the images showed a box with a list of items included with the headset. In addition to the Rift, it ships with a controller called a Simple Input Device, a device called a gamepad, cables, and a "Rift tracker," presumably for tracking head movements. The Simple Input Device has a circular touchpad, plus and minus buttons, and a button that might be for returning to a previous screen. The gamepad wasn't shown in any of the images. The stand-like accessory could be the tracker. Pricing hasn't been shared, but Oculus CEO Brendan Iribe said at a conference last month that the headset and a PC equipped to run it would cost approximately US$1,500. 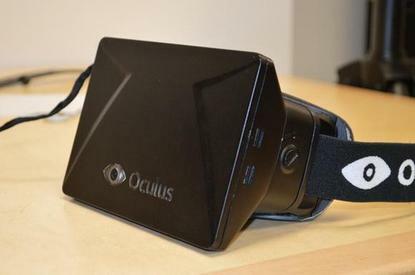 Judging from the computing specs Oculus recently released, consumers will need a well-appointed PC to use the Rift.